According to Mobileburn, Samsung has made the Galaxy R official. 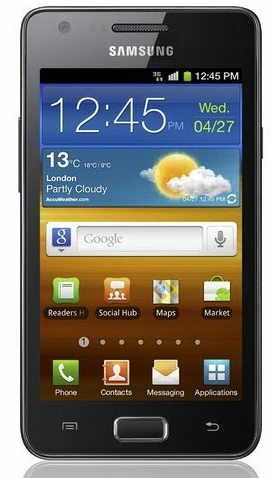 Basically it is a more affordable version of the Galaxy S II. The device looks almost same as the S II, but off course there are some minor changes. The R is a little thicker and the screen is slightly smaller at 4.2 inches in size and yes, it is the Super AMOLED Plus display. The camera is lowered down to a 5 MP unit that only records 720p HD and also a 1.3 MP camera in the front for video chat. There isn’t any word of the processor, but it will be a dual-core, probably an Nvidia Tegra 1GHz. 8GB of internal memory is supplied, and it supports microSD cards up to 32GB. The battery will be a massive 1650mAH, which seems enough for the Android 2.3 handset. No news on the price, but is said to be available in this week itself in some parts of Asia.